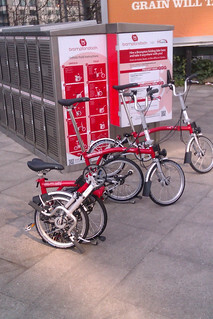 Bicycle sharing with a twist: Brompton Dock launches at UK railway stations | O'Really? Kudos on the idea, but from experience these folding bikes are pretty lame. It’s like the worst of everything a bike has to offer, only it folds into a heavy, awkward package at the end. And the folded result is only slightly smaller than the whole bike, just a different shape. Not a fan, especially when a regular bike will do just fine. Hi Daniel, given the choice I’d much rather ride a “real” bike but many people don’t have that luxury. If you’ve ever need to get a bike onto a train then you’ll know what a pain it can be – something these bikes solve rather nicely. Not everyones cup of tea perhaps, but “regular bikes” are often not an option.